3.5" to 3.5" audio cable. Connect one jack into phone 3.5" port and another jack into your computers microphone port. Most times it's a colored in pink or has a little microphone icon near. Turn on the FM radio on your phone and unmute the Microphone in the Volume control. On my Realtek soundcard it is called Pink In in Volume control panel. And that's all! You can now record the music from your favorite radio station or listen to iPod music on your laptop/desktop PC speakers. 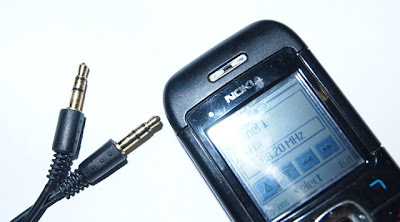 Some phones has 2.5" inch headphones port so you will need an additional adapter.